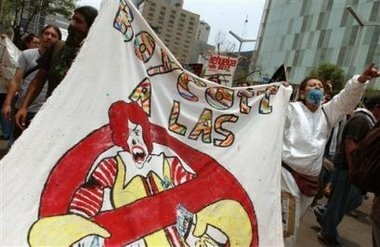 Poor Ronald McDonald gets picked on at the “Day Without Gringos” protest in Mexico City even though the local stores are Mexican owned. 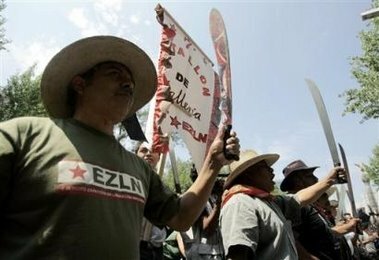 Rallies, road blockades, boycotts and other actions are planned South of the US-Mexico border in solidarity with the “Day Without an Immigrant” campaign inside the US – a nationwide boycott and labor strike of immigrants and their supporters. Vandals spray-painted a US bank in Mexico City today. 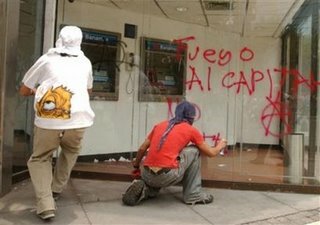 In Mexico, trade unions, groups of activists and lawmakers offered their total backing for the demonstrations that migrants in the United States will hold on Monday to demand amnesty for undocumented immigrants and to protest a strict immigration reform bill passed by the lower house of Congress. Immigrant rights groups are also organising a national boycott, urging immigrants in the United States to stay home from work and school, and not to buy or sell anything on Monday. The idea is for immigrants to make their economic clout felt. A quarter of formal private-sector jobs with regular pay in Mexico are provided by U.S. firms. 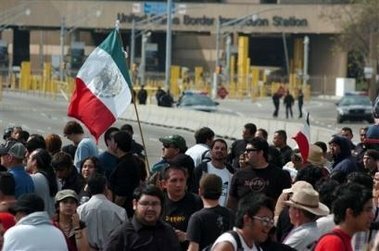 At least half a dozen Mexican governors joined the boycott of hundreds of American goods and services today in support of the “Day without Gringos” protest today. American companies employ 40 percent of the Mexican work force.